Fighting Parkinson’s, and your dopamine! There is a big concern with Parkinson’s about dopamine…is it there? is it depleted? is it flowing? This concern about dopamine brings many people to a place of fear and doubt. When doing the Recipe, if symptoms seems a bit worse, fear creeps in and brings along its friend, doubt…is this really working for me? is my dopamine really there? Simple answers: Yes. Yes. To assist all of you with the simple “Yes, Yes,” answers, I am going to remind you about a study in Denmark from three years ago that says that the brain cells are not dead and the dopamine is not depleted. As you know, it is the position of Western Medicine that the substantia nigra, basal ganglia, in the brain are dying or already dead leading to a depletion of dopamine in the brain. They say they do not know the cause of this nor can they cure it, so they seek to treat symptoms of Parkinson’s with dopamine enhancement and dopamine replacement medications. For those of you who have been following this blog for a while or have spent any time with the Parkinson’s Recipe for Recovery®, you know I always have taken the position that the dopamine is not depleted, only blocked, and that the dopamine faucet is turned down low. “I do not believe that the dopamine is depleted or gone. I believe that the body has been working in adrenaline mode and dopamine has taken a back seat, essentially, it has mostly closed the faucet and is not flowing at full capacity. It is why I believe the medications cause Dyskinesia – the body is being given artificial dopamine replacements that are not able to fully assimilate into the system and thus cause uncontrollable movement as opposed to controlled movement. Three years ago, a study came out of the University of Copenhagen in Denmark. As you will see, it confirms the Recipe’s view of dopamine being blocked and refutes the Western Medicine view of depleted dopamine and dead brain cells. Scanning the brain of a patient suffering from Parkinson’s disease reveals that in spite of dopamine cell death, there are no signs of a lack of dopamine — even at a comparatively late stage in the process. Click here to read the entire article yourself. A few things I would like to mention at this point. 1. This report comes as no surprise as I, and so many of you, are living proof that our dopamine is not depleted. However, it is very exciting that there is three-year-old scientific proof that we have been correct all along. 2. If you are taking medications, please keep taking them. If you stop taking them cold turkey, nothing good will come from that. Click here to read more. 3. 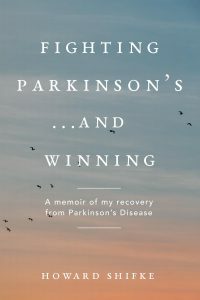 To enhance the hope and faith of people with Parkinson’s around the world, I ask that you please send a link to this blog post to everybody who you know and encourage them to send it to others. It is important that people who are filled with fear that their dopamine is depleted and their prognosis is hopeless see this blog post and article. The reason I ask that you send a link to this post instead of just the article is that if people read the article only, it gives them hope but it does not tell them what they can do to recover. If you provide a link to this post, then they will come to the blog and site, see the Recipe, see this wonderful community made up of all of you, and they will realize that a road map to their recovery and other travelers on the path to recovery already exist and have existed for years. Imagine how that will enhance their faith and hope. “You have the power to heal yourself.” Marie did. Pratima did. Betty did. Helen did. Tony did. And you are. “Together we have the power to heal the world.” And we are. Please send a link to this post to everybody who you know and encourage them to read the post and send it to others. It is three years after this study was published, and nothing has surfaced to challenge its accuracy. When fear brings it’s friend doubt to the party, have your bouncers, Faith and Hope, show fear and doubt to the exit. They need not ruin your dopamine party. 3 Responses to Fighting Parkinson’s, and your dopamine! Thanks, Howard! Somehow, believing and shaking off any negatives as the symptoms arise changes something. It truly does dramatically reduce the symptoms. All God’s blessings upon everyone. something else: correct me if I’m wrong, but there is more dopamine produced in the gut than in the brain > so: when I go for walks I imagine dopamine moving up my spine from gut to brain, then circulating back down the front of my body, back to my gut > I repeat the cycle over and over, then give my body and mind time to assimilate the activated energy > does this make sense to anyone else? I am not certain one way or the other about your theory. However, if this visualization is something that is working for you, then keep doing it. It is important to get more energy to the brain and your visualization is similar to the visualization in the Recipe’s Medical Qigong for the Kidneys (elevating), where the visualization is bringing energy from the kidneys up the spine to the brain.